Diana Ernestine Earle Ross (born March 26, 1944) is an American singer and actress. Ross was lead singer of the Motown group The Supremes during the 1960s. After leaving the group in 1970, Ross began a solo career that included successful ventures into film and Broadway. 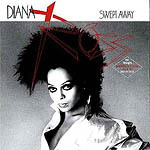 Swept Away is a 1984 album released by American singer Diana Ross on the RCA label. The album followed Diana's disappointing 1983 release, Ross, which sold only 300,000 in the United States.